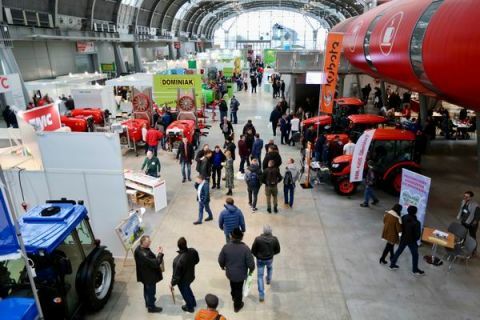 The 4th HORTI-TECH - the Fruit and Vegetable Production Technology Expo accompanied with the FruitPRO conference were launched at 10.00. - We are about to start a new phase of cooperation with Targi Kielce - continued Cezary Urban, Director of the Plant Protection Products Department at BASF Polska. - For the first time FRUIT PRO is held in a new location. 2018 was an extremely difficult year for agriculture and horticulture. The very hot and dry season resulted in record-high harvests not only in Poland but also in Europe. Record low prices of apples is the consequence of that. Now everyone wonders what will be the next season be like? There is hope that orchards may rest after an intense year, yields will be lower and the price of apples will thus be adjusted. Fruit farming is a long-term investment. The conference offers an incentive for detailed activities planning, suggests solutions in this matter. This is crucial in the current situation of Polish fruit-growing sector. What, according to specialists are the areas that require planning? First and foremost, the workforce. Employees become scarce, remuneration becomes higher and this trend will continue in the next years. Second - new sales markets acquisition. The 5-year Russian embargo caused that the local market has been saturated with fruit from other regions and Polish apples would not regain their position, even if the eastern market reopens. Thirdly - a change in varietal structures and improvement of quality are what Polish apples export needs. These three guidelines for Polish fruit farmers may translate into effective competitive advantage which can win new markets. - The record-breaking harvest of 2018 of 5 million tons made us at par with the apples production level in Usa. It is not possible to monetise this over-surplus. The quality may not meet the expectations of some consumers, even those indiscriminate - Professor Kazimierz Tomala, vice-rector of the Warsaw University of Life Sciences at the expo and conference opening ceremony. - Therefore, I invite you to make the best use the knowledge offered by specialists. Knowledge is the only way to survive this difficult for growers.